The Rue Bonsecours in Old Montreal, Quebec in Canada is one of the oldest streets in the area and the buildings show their French architectural beauty in the glow of the night lights. An elegant restaurant is just one of the townscape highlights on the Rue Bonsecours along with quaint shops, hotels, bars and cafes. This street opened in 1773 and is one of the areas that must be seen while visiting Old Montreal as some of the buildings also date back to the 17th century. During the night time hours, the street is aglow in yellow hues creating a romantic atmosphere for a walk after dining at this restaurant. 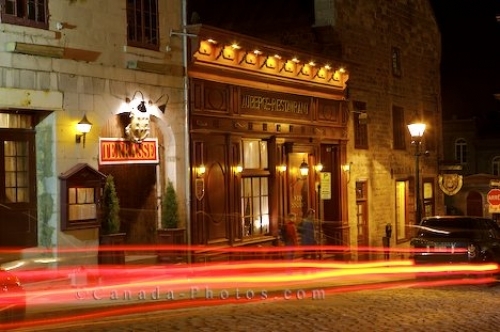 Restaurant along Rue Bonsecours at night in Old Montreal, Montreal city, Quebec, Canada. Picture of a restaurant illuminated by the night lights along Rue Bonsecours in Old Montreal, Quebec in Canada.